Companies like Pinterest and Wayfair are adopting the technology that lets consumers look for products using photos rather than text. Here’s what we learned about why it’s growing and what it means for the home industry. Sometimes, words fail us. Sometimes, they can’t fully contain what we want them to. This is especially true when it comes to online shopping — searching “polyester grey rug with abstract pattern and turquoise and yellow accents” might turn up some results, but will only get a customer so far. Enter visual search technology, which allows consumers to shop for items using images rather than text. We talked to visual search experts to find out more about its applications and implications for the future of retail. Here’s what you should know. While visual search technology has other applications, it has taken off in the retail sector because of the visual nature of the industry. It uses artificial intelligence and deep learning to recognize and sort images based on qualities like shape, color and pattern. Amazon debuted visual search in its app in 2014. Pinterest made waves when it rolled out its visual search feature in 2015. 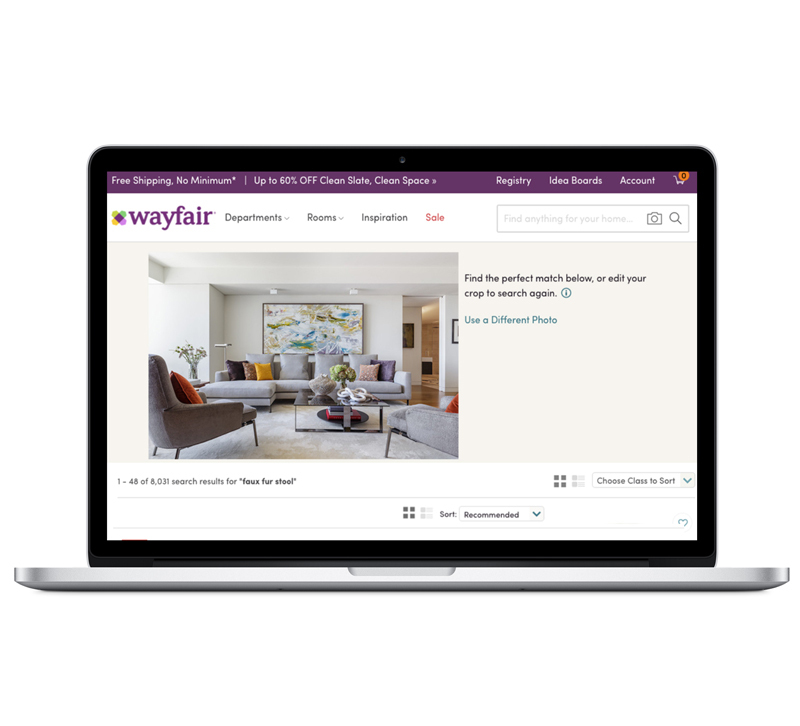 Last month, Wayfair unveiled its visual search engine, which lets users upload photos to find products. “We know that everyone has a unique vision for their home and that ideas and inspiration can come from anywhere. A sofa in a friend’s house, a Pinterest board, a barstool at a favorite restaurant or a pillow featured in a design magazine, can all spark ideas for decorating one’s home,” Wayfair Co-Founder and Co-Chairman Steve Conine said in a statement. Incorporating visual search allows consumers to instantly find the products they’re looking for, right at that moment of inspiration. Oliver Tan, the CEO and Co-Founder at artificial intelligence startup ViSenze, says the technology makes the search and discovery process more efficient. Sacha Lowenthal, Sales and Marketing Operations Manager at visual search company Cortexica Vision Systems, says the immersive nature of visual search technology helps create loyal customers. “This enhanced shopping experience also removes search barriers in the user journey such as incorrect keyword filters, out-of-stock items, and it has also been shown to increase basket size as the customer is able to search for exactly what they want,” Lowenthal said. Lowenthal says visual search is a natural progression for the home industry, given its visual nature and how difficult it can be to find specific items using keywords. At Cortexica, she says they’ve seen more businesses engaging with the company in the last 12 months than the previous two years combined. Pinterest reported in May that it sees 250 million visual searches a month. It doesn't look like visual search is going anywhere anytime soon. Tan says in the years to come, it will become de-facto along with text search for all online retail. As consumers are seeking unique shopping experiences with a seamless blending of online and brick-and-mortar, visual search is one more tool retailers are using to set themselves apart. What are your thoughts or concerns on the technology? Let us know in the comments! Visual search would make it so much easier for consumers to locate replacement products or parts, especially when part numbers and names aren't readily available.